The manufacturing sector employs 1.7 million Canadians. OTTAWA — Amid hopes that Canadian manufacturing will drive economic growth in a country reeling from low oil prices, internal federal documents warn the sector's rebirth is staring at "significant" structural obstacles. In a recent memo addressed to Economic Development Minister Navdeep Bains, advisers point to industry hurdles that include low productivity, poor innovation, a failure to scale up and weak participation in global value chains. The fate of Canadian manufacturing will have consequences that reach beyond the industry, the briefing note says. "The manufacturing sector is a cornerstone of the economy and a catalyst for broader economic activity," it notes, identifying several "hot issues" for the new minister. "It is expected to help spur export-led growth in the second half of 2015 and into 2016; however, it also faces significant structural challenges." 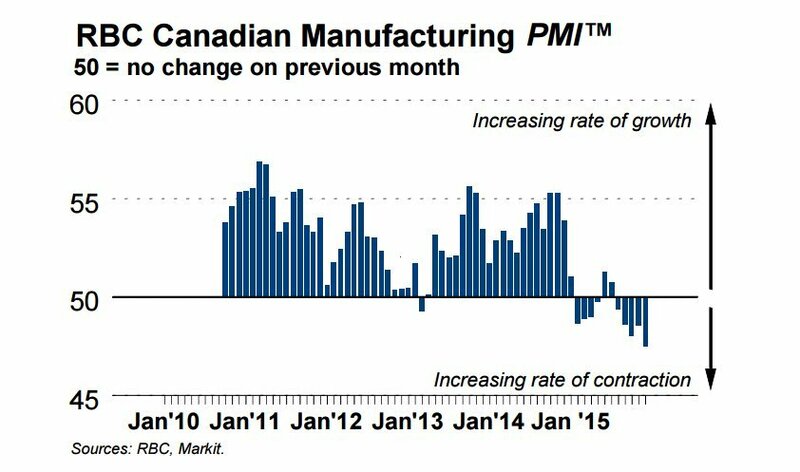 RBC's Purchasing Managers Index shows Canadian manufacturing has sputtered over the past year. 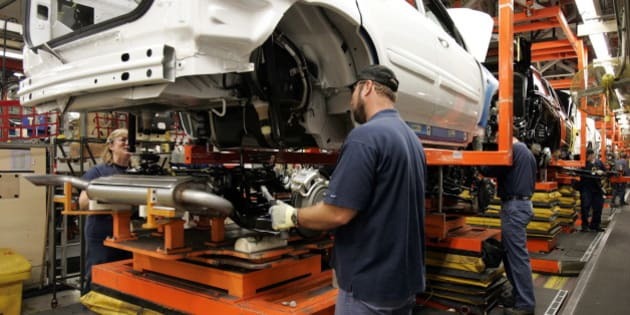 Manufacturing accounts for nearly 11 per cent of Canada's growth — as measured by gross domestic product — and employs 1.7 million people, the memo says. The document, labelled "secret," was prepared for Bains as he took over the cabinet post in November. It was obtained by The Canadian Press under the Access to Information Act. The memo could help guide Bains's decisions and also influence the federal budget, expected late next month. The Liberal government has been exploring ways to respond to the economic shock of sliding commodity prices, which have hit the economy hard — particularly in the oil sector. The slump forced the economy to contract over the first half of 2015 — in large part because non-energy sectors were very slow in picking up the slack. Many experts had been expecting the exchange rate, which has dropped along with oil prices, to help revive exports and the manufacturing industry. The authors of the briefing note place some of the blame for the lack of a bounce-back on inadequate reinvestment. Canada, like other developed economies, lost a large number of jobs, companies and investment during the global recession, they note. Moving forward, the document says, the sector must deal with a global manufacturing environment that's rapidly changing due to technological advances "poised to disrupt many of the sectors that anchor Canada's economy." "This represents both a threat to incumbent business models and an opportunity for those that are able to be on the leading edge of new technology." Small- and medium-sized manufacturers have struggled to reach the scale of their international competitors, preventing them from competing on the global stage, it adds. The news isn't all bad, however. The advisers say Canada packs the potential necessary to keep up with the changing industry, thanks to a solid science base and highly educated workforce. "Canada's rich manufacturing heritage and established presence across the country is a strong foundation for future success." Getting there will require new streams of sustained investment will be necessary for innovation, productivity-boosting technology and research and development, the memo notes — adding that Canadian firms have been "chronically under-investing" in those areas. Canadian firms have had to adjust to the big shift toward "value-added" manufacturing and their shrinking share of the ever-important United States market, said Craig Alexander of the C.D. Howe Institute think tank. Alexander said that while the lower loonie helps increase the competitive edge for Canadian companies, the falling exchange rate also discourages investment because it hikes the cost of imported equipment. The shadow of uncertainty over the economic outlook acts as another deterrent to investment, added Alexander, C.D. Howe's vice-president of economic analysis. "This is actually one of the things I'm deeply worried about, because Canada's competitiveness is extremely weak, particularly when you look at Canada's productivity performance." Asked about the challenges faced by the manufacturing sector, Alexander exclaimed, "Oh heavens, where to start?"